Mount McKinley or Denali ("The Great One") in Alaska is the highest mountain peak in North America, at a height of approximately 20,320 feet (6,194 m) above sea level. It is the centerpiece of Denali National Park. 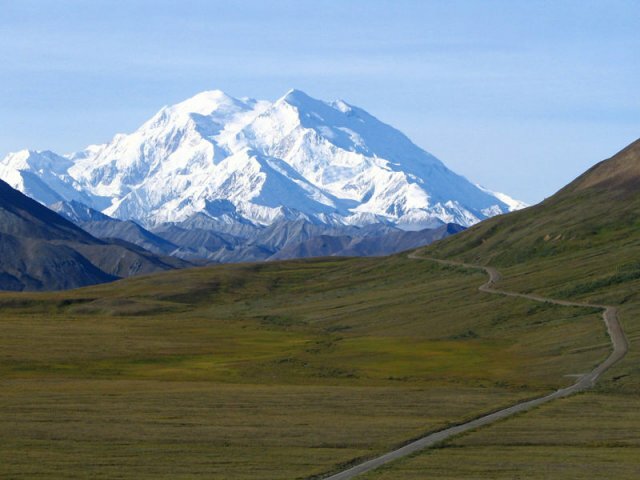 Mount McKinley has a larger bulk and rise than Mount Everest, although the summit of Everest is higher measured from sea level 29,028 feet (8,800 m). Everest's base sits on the Tibetan Plateau at about 17,000 feet (5,200 m), giving it a real vertical rise of a little more than 12,000 feet (3,700 m). The base of Mount McKinley is roughly a 2,000-foot (610 meter) elevation, giving it an actual rise of 18,000 feet (5,500 m). The mountain is also characterized by extremely cold weather. Temperatures as low as -75.5 °F (-60 °C) and windchills as low as -118.1 °F (-83 °C) have been recorded by an automated weather station located at 18,700 feet (5,700 m). There is also a higher risk of altitude illness for climbers than its altitude would otherwise suggest, due to its high latitude. 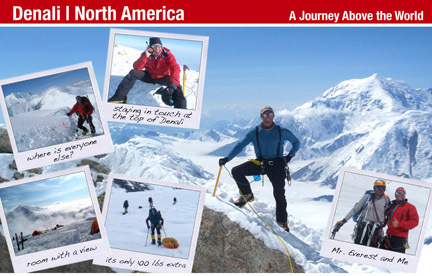 At the equator, a mountain as high as Mount McKinley would have 47% as much oxygen available on its summit as there is at sea level, but because of its latitude, the pressure on the summit of McKinley is even lower (42%).